Following the slate of Italian rosés came another non-traditional entry into the pink wine market – the Rainbow Nation of South Africa. South Africa has a bit of a rocky wine history. The wine industry started there in the late 1600’s and grew until the mid-19th century, when the grapevines received a one-two punch of a grape mildew infection called oidium and an infestation of the phylloxera louse, which proceeded to almost destroy the grapevines of South Africa, much as it was doing at the time to the vineyards in Europe. When the South Africans replanted their vineyards, they planted them in high-yielding grapes like Cinsault and Grenache, resulting in a huge stockpile of wine that eventually resulted in a great deal of wine being simply dumped into rivers or similarly discarded. The state stepped in and set limits on grape production, varietals grown, etc. to allow the industry to recover, but – simultaneously – they were putting the finishing touches on that whole Apartheid thing, which made exporting South African wines a bit problematic for obvious reasons. Once Apartheid was lifted and exports began in earnest, grape producers were able to start focusing on the production of quality juice, and the industry finally found its legs. 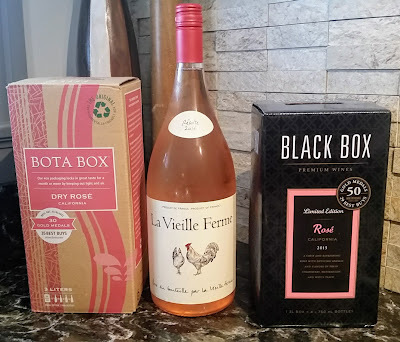 South Africa is best known for rustic reds, especially big reds made from Pinotage, so I was interested to have a look at a couple of rosés from the other edge of the globe. The good folks at Colangelo (thanks, Kelly!) sent along a pair of bottles for my perusal. They actually included a few recipes to try, but between the completion of the dissertation and some other regular work stuff, I wasn’t able to do much exploratory cooking. Regardless, here’s how this set turned out. De Morgenzon “DMZ” 2013 Cabernet Rosé – I understand that this wine’s moniker comes from an abbreviation of their name, but I think they might need a slightly different marketing strategy for this wine here in the States. In any case, this salmon colored bottle of pinkness is assertive for a rosé. The nose is fairly fragrant with a strong note of yellow. I got apple and cranberry on the palate with much more creaminess than I expected. This entry certainly isn’t a light, crisp rose from Provence. It came across to me as fuller and a little earthy, if you can believe that. The finish has a little bit of a citrus clip, but the main push is fruit – strawberries and cranberries – that last a good while. I thought this was a rosé on the richer side that could substitute for a light red. Good value at $12. 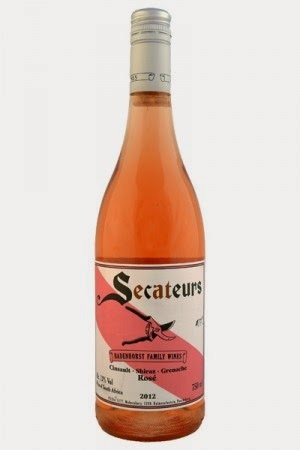 sourced from some of the older vines on the Cape – vines that are trimmed with tools called – you guessed it – “Secateurs.” With that blend of grapes, I wasn’t surprised that it was much more reminiscent of a Rhone Valley rosé, with a good backbone of minerality and crispness to go alongside the tart strawberry flavors. The finish is minerally and somewhat soft, making it a really nice flexible food pairing wine. It’s got some nice complexity, and is just an all-around good sipper. Pretty good value at $15.